Perhaps my affection for tradeshows comes from my background in theatre. In the business world, I haven’t found anything which rivals the palpable electricity in a theatre hours before opening night except for the energy in a hall at a tradeshow. Replace sets with exhibits, actors with employees, an audience with attendees and a director, with well, the Marketing Director and there you have it -an industrial theatrical performance . . . of sorts. The expansion of the internet with an emphasis on content marketing and social media has provided alternate routes to customers and as pressure mounts to be more competitive, companies are trying to do more, with less. Often this translates into an increase in market penetration expectations without an increase in budget. This, in turn, leads to internal debates which can sound a little bit like a rendition of He Loves Me, He Loves me not. “There’s no value in Industry Expo X”, while another emphatically declares, “Industry Expo X is the only show for that market, we have to exhibit”. 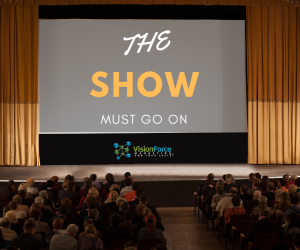 If your company is constantly plucking the daisy petals to determine the value of a show, allow me to point out the merits of exhibiting, including some of the lesser known benefits. Despite the competition with Television and Movies-on-demand, live theatre has survived. It survived the silver screen, small screen, and the smartphone screen and I believe tradeshows will survive the internet, inbound marketing, and incessant push to ‘do’ social media, for the same reason – there are some things that are irreplaceable and the live human experience is one of them. The incredible marketing we can do via the internet really is awesome, but I maintain that tradeshows and exhibitions remain venues where social graces, business acumen and a solid product offering trump online marketing when it comes to real customer interaction and the cultivating of relationships. In addition to the obvious face to face communication with prospects and customers, the camaraderie that I have seen generated among booth staff rivals any contrived raft-building out of twizzle sticks sort of team-building event. Stay tuned for Part II of The Show(s) Must Go On to read the benefits of exhibiting.